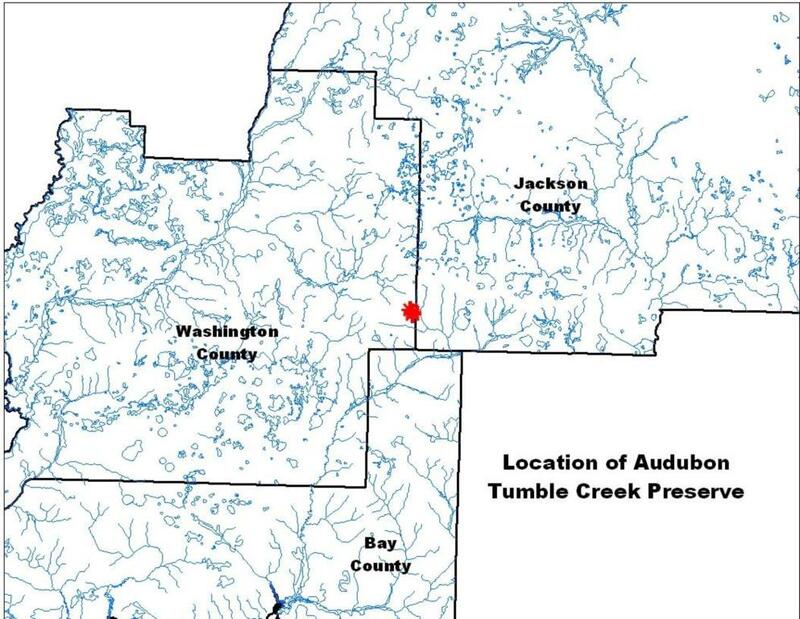 Tumble Creek Preserve in Washington County started with 20 acres of land donated by Marianna Audubon when they disbanded in 2000. Subsequent additions were purchased with the help of the Richard Jennings Estate, U.S. Fish and Wildlife Service, Jelks Family Foundation and the Gulf Power Foundation. The Bay County Conservancy purchased 10 more adjacent acres in 2009, 15 acres in 2013 and 10 acres in 2015, for a total of approximately 92 acres of conservation land. The preserve consists of uplands with longleaf pine and turkey oak and wiregrass, with a stream running through it that has sphagnum moss bogs and wetland vegetation. It eventually connects with the Econfina Creek, thus protecting part of our watershed. Tumble Creek Preserve is located about 38 miles north of Lynn Haven, west of Highway 231. It includes a short walking trail that crosses the creek.